It’s that time of year again! Time for Classical Conversations six weeks studying orchestra and great composers. This year, we’re tackling the Baroque to Classical periods studying Handel, Bach and Mozart. I’ve said it before, but as a classical music junkie, this is one of my favorite parts of the program. I think an appreciation of great scores and understanding the intricacies of classical music is sadly lacking in our society. 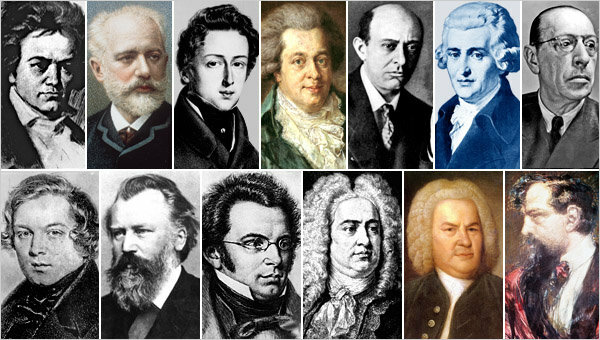 There is such a wide range of styles in classical music – thousands upon thousands of fantastic melodies, harmonies and rhythms – if you give it a chance, I’m positive you’ll find something you love. Today, we’re talking about partying like a rock star king, cruising down the river, with your own trailing dj boat. I don’t know what it’s like these days, since I’m (alas) not part of a monarchy, but it was certainly good to be king back in the Baroque Period. Music existed primarily for the enjoyment of the nobles back then. The emotional expression and show-offy-ness of compositions were considered too intricate for the common man to understand. As such, noble court, the wealthy and the Christian church were the primo job opportunities for musicians of the day. That’s where the work was. If you were really fortunate, you were the King, and everyone did what you said. All the time. Plus, you got rockin’ portraits made of you. Like this one of King George I of England. Can you imagine musical genius being at your beck and call? Pretend you are King George. Your wig itches, your son the Prince of Wales has been being a brat all year, it’s stuffy in the palace and you’ve decided to throw an epic Summer of ’17 bash. That’s summer of 1717. So you summon your team. After you’ve determined the theme, planned location details with your event coordinator and discussed food options with your chef, you chat with your musician, who in this case happens to be George Handel, to request a little party music. Crazy. Canaletto’s painting of the Thames gives us an idea of the kind of frivolity old King George wanted. George Frederic Handel was born in Germany, schooled in Italy and is known as one of the greatest British composers. In 1710, Handel was appointed the kapellmeister (head music man) to George Louis, the elector of Hanover when the future king was stationed Germany. 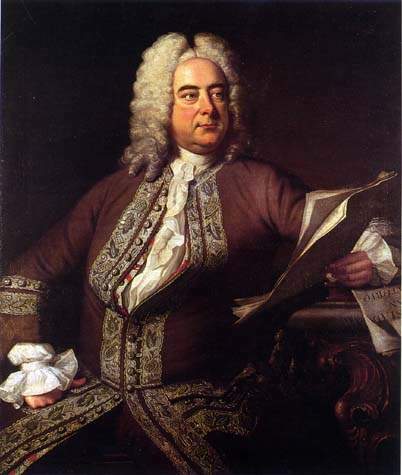 Handel went to London that year, and stayed after his operas were popularly received. Handel found London far better for his prosperity than Hanover. He won his way into favor with the current Queen by composing an ode for her birthday. 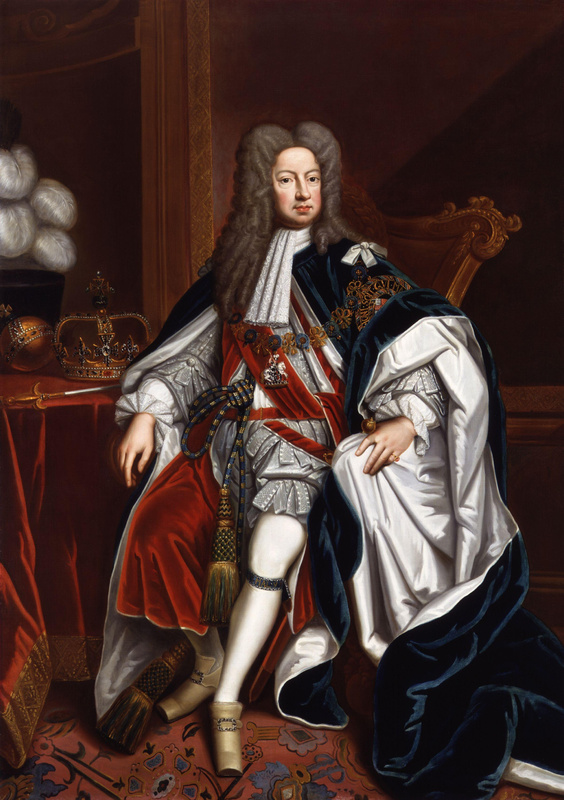 Then when Queen Anne died in 1714, Handel’s old buddy from his kapellmeister days became King George I of England. Handel spent the rest of his life in England, composing and generally being very rich, important and popular. Handel must have loved a good shindig, because in 1717 he puts together a brilliant collection of party music for King George’s booze cruise down the Thames. Drawing upon various regional standards, Handel creates a delightful collection of dances that are so well received by King George I and his barge party companions, that the monarch requested to hear the pieces over and over. Handel and his 50 or so musicians spend about 4 hours repeating the pieces as their barge floats along next to the king’s party boat. A rousing success indeed. 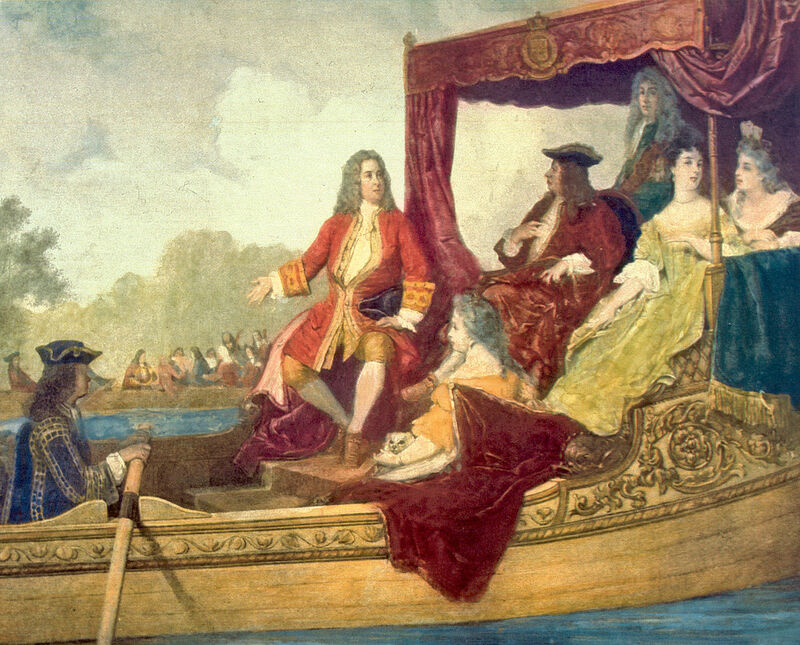 Here’s Handel (left) and King George I in a painting by Edouard Hamman. As you listen to this piece, pay attention for a couple of things. First, it is in a traditional A-B-A sonata form. 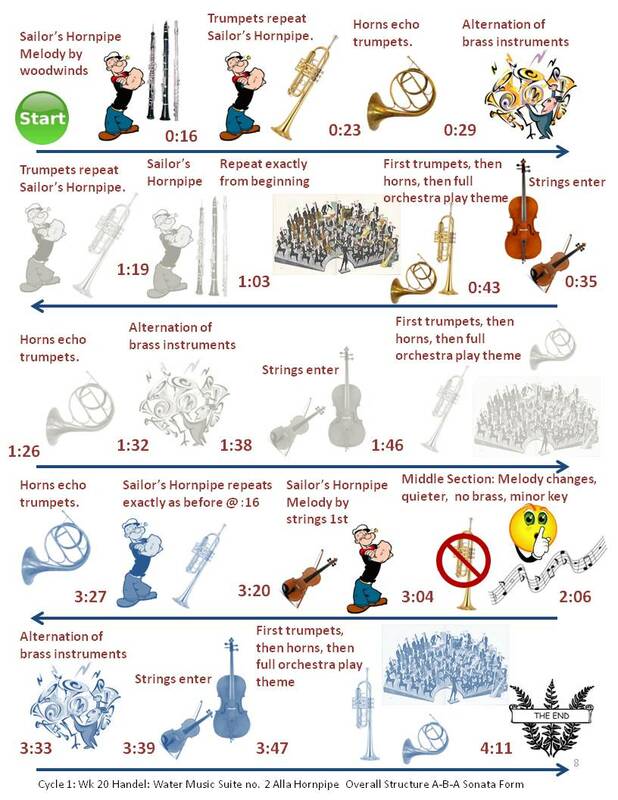 Meaning there’s a first section “Sailor’s Hornpipe”, which was a specific dance tune of the day. Then the “A” theme is repeated (shown grey) before the second section comes in at 2:06. This “B” section is completely different from the familiar Sailor’s Hornpipe theme. The “B” section ends at 3:04 and we are back to the Hornpipe (theme A) for the remainder of the piece. Printable version of this listening map found at the end of this post. I like to share sonata form with my students by demonstrating the very familiar tune Twinkle Twinkle Little Star. It also is a perfect A-B-A sonata form. A: Twinkle, twinkle, little star, How I wonder what you are. B: Up above the world so high, Like a diamond in the sky. For those students not able to follow along the listening map, here’s a nice coloring page for them to just draw what the music makes them feel. Here’s the exact music to follow along on my listening map. 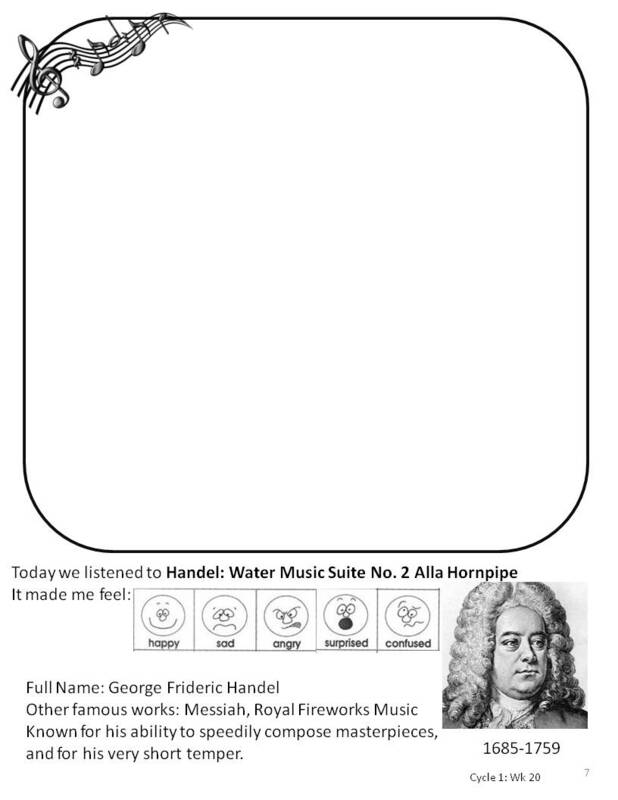 Here are the links to print my listening map, coloring page and biography of Handel. Remember to follow the arrows on the listening map! I love sharing my creations with you, and hope get great use out of them. If you’d like to re-share them, please do so with a link to this page, not a direct link to the listening map/drawing pages. Happy Listening! Enjoy! Check out my post “A Thousand Stories to Save your Life” too — it’s one of my kid’s favorite classical pieces and includes puppets! Will do! My kids love puppets 😊 thanks!! I can’t get the music to play. Is there a trick to it or do you have the name of the song? I’ve been out of town for a few days. Sorry for the late reply. The name of the piece is Water Music Suite 2 Alla Hornpipe by Handel. Not sure why it isn’t playing for you…it’s working just fine for me. Maybe try a different browser? The time in seconds may not be exactly the same if you use a different recording. Hooray! I’m thrilled to hear it!